Are you thinking about buying a fixer-upper? Or maybe you’re finally ready to move forward with a home remodeling project? Whatever your plans, it’s good to know what to expect before you begin. Home remodeling projects can be complex and sometimes its seems the end is never in sight. But if you go into the process armed with knowledge, it will be much less stressful for you and your family. Here are the major stages you can expect to move through on your way to a completed project. Design – Make decisions before you begin about what your project is going to be and what the details of the design are. If you are hiring professionals, they will provide architectural plans. 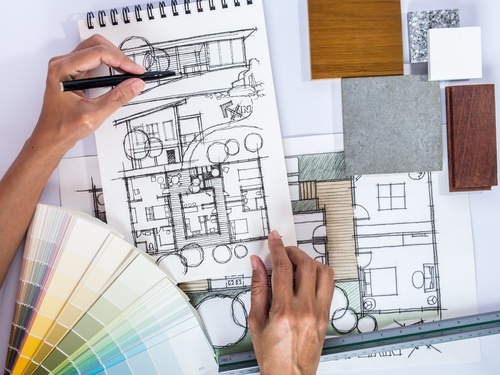 If you are completing the project by yourself, you should at least try to sketch out your ideas onto paper so that everyone involved is on the same page before you begin. Budget – Before you begin tearing down walls, decide what your budget for the project will be, and how you will stay within that budget. Be sure to include all the appropriate costs, such as new appliances and construction materials, and even new paint or wallpaper. Prepare – If you’re hiring professionals, research and interview contractors. Apply for and secure any permits that are needed to complete the renovation. Once your preparations are complete, it’s time to move on to the next phase – demolition. During this stage, you or your contractors will be ripping out anything that needs to be removed and replaced. This can include walls, ceilings, cabinets, windows and floors. If you feel comfortable doing this yourself, you can save some money. If not, leave it to the pros – especially if any areas being demolished contain asbestos or lead-based paint. Once construction is complete, you may think you’re finished. But wait! There’s one more important step before you’re done and that’s cleaning up. You can expect the contractors you hire to do some basic cleaning, but to make your home truly livable and beautiful again, you’ll need to get in there and really clean. This includes removing all the dust and debris that has accumulated. Once your cleaning is complete, it’s time to move back in. This is the fun part, where the renovations you’ve been dreaming about are finally a reality. Enjoy unpacking and moving into your freshly remodeled space!